Warm-up Party (24.2.2017): Included in registration fee - batlabs Jimdo-Page! Celebrate with your friends, talk to your collaborators, meet new people and make friends during the warm-up party on Friday, 24th of February 2017. We will have a poster-pasta party on Friday evening, during which you may combine scientific discussions with delicious pasta and some red vine (or non-alcoholic beverages). On Saturday evening (25.2.2017), we invite to the conference banquet at the Natural History Museum in Berlin. Dine with the dinosaurs, right in the middle of the exhibition. Check out one of the rare specimens of the Archaeopteryx while you enjoy your meal. A dinner experience you will never forget. This social event comes at some extra costs (regular participants: 65 €, student participants: 45 €) and is limited to 150 participants (first come, first serve). Let’s party at the ‘Grüner Salon’ of the Volksbühne in downtown Berlin. The Volksbühne is a renowned theater founded and built around 1914. 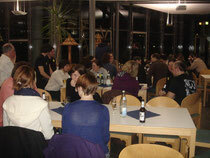 The ‘Grüner Salon’ is a wonderful place to engage in further scientific discussions and to celebrate. We will offer a buffet of vegetarian and non-vegetarian food and a welcome drink. Please note that you will have to purchase additional drinks and beverages. Please book your ticket for 40 € (30 € for students) when you register. Places are limited so please book early! !